Have you ever taken a career break? Or drastically changed professions in the middle of your career? Or maybe you want to re-enter the workforce? There are many reasons why we may need to step back from our careers. But we often find it difficult and daunting to re-enter the workplace and get our careers back on track, particularly at the level that we left. 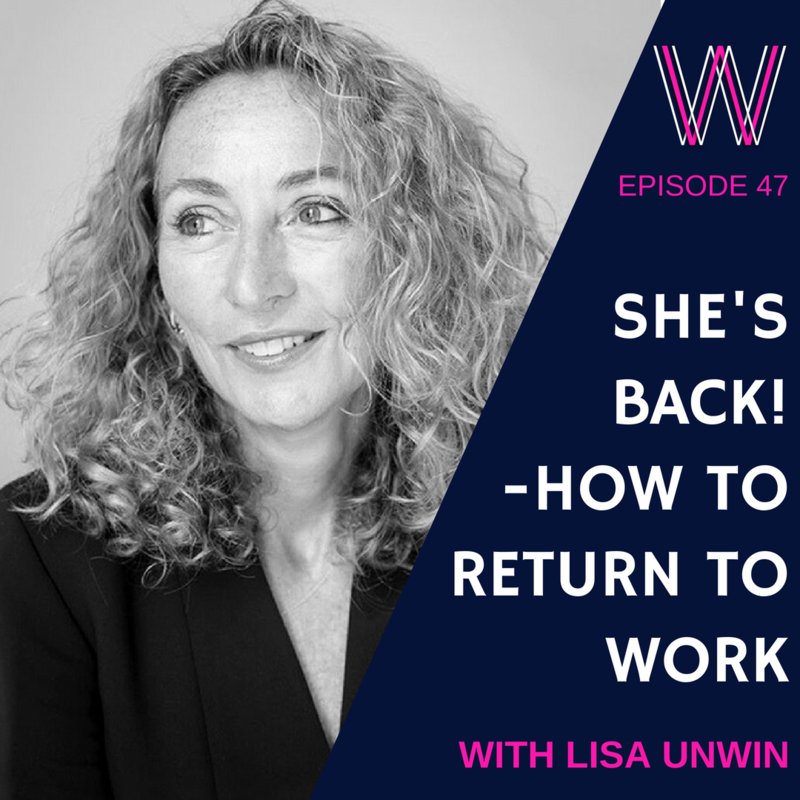 We speak with Lisa Unwin, founder and author of “She’s Back”. Whether you are at the beginning, middle or nearing the end of your career, Lisa offers practical advice and tools to navigate your career in the age of economic, social and technological disruption. Appreciate that work adds value to your life – the people you meet, the skills you learn, the intellectual and financial stimuli, etc. We live longer so we need to work longer – and the benefits of compound interest! Play the long game – you may have to make immediate sacrifices for the long-term gain! You can read more about Lisa on her website and you can buy her book She’s Back on Amazon. If you enjoyed this podcast, we suggest listening to the value of creating family-preneurs and how to protect your lifestyle. Announcer: 00:00 Welcome to Working Women’s Wealth, where we discuss what it takes to build real wealth in a way normal humans can understand. Here’s your host, Lisa Linfield. Lisa Linfield: 00:21 Hello, everybody and welcome to this week’s episode of Working Women’s Wealth. Today, I’m joined by Lisa Unwin. She is both the founder of She’s Back, the company, and the author of a book called She’s Back. Hello, Lisa, and thank you for joining us. Lisa Unwin: 00:39 Hello, thank you for having me. Lisa Linfield: 00:41 So Lisa, you’ve written this book, She’s Back, which is about women reentering the workforce essentially. What is your background and why did you write this story? Lisa Unwin: 00:52 So my background is I first joined [inaudible 00:00:55] in about 1998, no 1988. I trained as an accountant and I moved into management consulting. I became a partner there in the year 2001, which was bad timing because it was shortly before the firm collapsed under the weight of the Enron scandal. In the UK, the firm was backed by Deloitte. I moved across to Deloitte as director of brand and communication. I had what I thought was a very successful career. I was very happy. Then, all of a sudden one year, the wheels fell off. I had a nanny who helped look after my two children, who were four and six. She resigned, and it was just at the time my kids were going to be starting full time school. My husband at the time was working in New York, Monday through Friday. I just thought, “I can’t see how I can keep hold of a good job, which is quite demanding, and bring up my young children, and make sense of life.” So, I took a career break. What nobody told me was that my kids wouldn’t be four and six forever. Fast forward four or five years, I found myself listening to the radio. I think it was Women’s Hour episode on, they had this power list. I just thought, “I wonder what would have happened to my career.” I had 20 years experience behind me, and no plan as to what I was going to do with the 20 years ahead. I looked around at the school gates, and I saw so many women like me that might have been lawyers, bankers, advertising executives, you name it. People from all sort of different professions who had great careers that had just not managed to sustain those careers through the years of often children being young. It wasn’t just children, that was one of the main reasons. Over the years, we’ve come across lots of experts in different areas who we knew could help us with different aspects of that problem. I sat with my business partner, Deb, decided we would write the book, and we’d enlist the help of lots of experts to make it really practical, very action oriented, for the women involved. Lisa Linfield: 03:20 What were your biggest insights from writing this book? Lisa Unwin: 03:23 The biggest insight was there were lots of books written about the probably. Lots of books exposing what the issues are, but nothing telling you actually what can you personally do. This is about not waiting for government to change legislation, not waiting for organizations to change their culture, because we can’t wait. My biggest insight was there are actually things that people can do as individuals if you just give them a few hints. Give them a few tools and tactics, people can take matters into their own hands, and it is possible to change things. Lisa Linfield: 03:53 You come from a professional background, the management consulting background. One of the things you said, which really intrigued me was that one of your biggest questions were if the same amount of women and men joined the professions, and we know for example in many of the country, there are actually more women than men going into and coming out of university. If the flow into the funnel is the same or bigger when it comes to women as men, why do they leave? Why at the end of the day are their more men that are making it to senior management and not women? Lisa Unwin: 04:33 We did some research in the first year of She’s Back’s life. We surveyed, I think we ended up surveying 1300 women who had taken career breaks. We asked them exactly that question. Typically, they tended to leave between 8-15 years into the professions. The average time spend in the profession would be about 11-12 years before they left. It was not as simple as to say because they had children and they couldn’t get the [inaudible 00:05:02] for work they needed. Although, that was one reason. It was also more subtle than that. You had a lot of women, for example, joining law firms who began at 22 thinking, “This is going to be a fantastic career. I’ve got a fabulous degree. The law firms want me. It’s very high paid.” Then, they would look up four or five years down the line and think, “Hold on a minute. I’m looking ahead. I can’t see any people, men or women, in this firm living their lives, managing work and family in the way I aspire to. I especially can’t see any women doing that. My goodness. I’ve made the wrong choice.” So, they change career. I remember one workshop, she was a lawyer actually saying, “I don’t even have a boyfriend. This is not about me having a family, but I’m never even going to get a boyfriend if I stay here because I’m working such long hours.” They’re rejecting the culture of long hours and presenteeism. The other things that happen structurally, I come from a management consulting background. Consulting, accounting, all that, they’re similar in that you join on a particular track, and the time in which you start to think about making partner is usually about your mid- to late-thirties. Decisions are made by the firm as to whether you can be on the partner track or not. Now, for women, that’s the time when you’re sort of thinking if you haven’t got children, you’re thinking abut whether you want them. That can be quite treacherous. But if you have had children, they’re probably young. It’s a really difficult time to be balancing all of that. Through a lot of people I knew, I was taken off the ball. They didn’t want to go on contract at that point, which should be fine because it should be okay to come back four or five years later and say, “I’ve gotten all that out of my system. I’ve now got more energy. I’ve got more time. Here I am. I’m ready.” But then we get hit by ageism and stretches that have written you off if you decided to step back at all or step off the career ladder. That is another reason why you get women stepping off, but never stepping back on again, if that makes sense. Lisa Linfield: 06:57 But that’s a matter of changing hearts. How does a country, how does a nation, how does the globe change hearts? Because there are so many different laws or principles or practices that companies and people can write in manifestos, but unless you change a heart, which is actually you don’t have to have made partner between 35 and 40, you can actually do it between 45 and 50. Unless you change hearts, and how do we go about doing that? Lisa Unwin: 07:30 I’ve observed a number of factors that are influencing people’s thoughts and behaviors in this field over the last two, three years since I’ve been doing my work. That pointed to three things in particular. One, there’s a lot of conversations going on about the 100 Year Life. It was a book by some professors in London Business School talking about a 100 year life, which is about how we’re all going to be living a lot longer. We’re going to have to have many more careers in our lives. We can’t start work at 20 and retire at 50, and think we’re going to sail off into retirement. That’s not going to happen. Nobody’s going to be prepared for that. We have to live longer and think about working into our 40s, 50s, 60s, in a way we’ve never done before. A lot of us are going to be more healthy. That conversation is starting to make people think about how they create career’s that are sustainable. Another interesting conversation that’s happening certainly here in the UK is around mental health. Men’s mental health in particular. The flip side that I’ve noticed of women being under employed, I’m frustrated that they can’t get back into meaningful employment is that you’ve got men that are getting burned out and completely stressed. If women did a little bit more and men did a little bit less, then maybe we’d have a positive impact on that mental health conversation. The third structural issue that I observe going on here anyway is that economically … We’ve got Brexit in the wing as well. Economically as a nation, we cannot afford to have this highly educated workforce sitting on their hands beyond 40 or 35, whatever it is they jump out. I think there are a number of conversations going on that are starting to change hearts and minds. Lisa Linfield: 09:04 Why do you think there is such a disconnect between the stated rules and the reality? Lisa Unwin: 09:11 I think a lot of times leaders are trying to do the right thing. They’ll make the right statements. If you look on any large organization’s website, you’ll see statements that say, “We value equality. We value diversity.” When you actually look, that’s rhetoric. When you look at the reality, decisions that are made don’t reflect those words. There was a very large organization collapsed recently in the UK called Carillion. It was a big construction company, an [inaudible 00:09:38] of lots of the smaller companies. On their website, they said they value diversity. They valued their supply base. They embrace diversity. They valued sustainability. Actually, in reality, their actions were all about driving short-term profits, which meant they didn’t pay their suppliers on time, and they drove prices down. Eventually the whole thing collapsed. I think you have to get to what the real motive is that drives behaviors. For them, it wasn’t even profit, it was revenue growth, which ended [inaudible 00:10:06] the business was unsustainable. It’s why you’ve got aspirational statements made by leaders that are not underpinned by real beliefs. I think you get contradictory behaviors. Lisa Linfield: 10:17 In the UK, there was recently a whole survey on paying the gender pay gap. What was the major outcome of that, and has it led to any change? There was a lot of naming and shaming that went. Lisa Unwin: 10:29 The BBC got themselves into all sorts of problems. They’ve had to take high, drastic action because their reporting was not just of a gender pay gap, it was naming some individual presenters who were paid differently to each of them. They got attacked in a very public forum. For everybody else, the pressure’s off really. In my view, they’re all as bad as each other. No one is feeling that they are the bottom of the pile in the ability to sort this out. I think whilst it’s a good thing that there’s transparency over the gender pay gap, I don’t think simply reporting it will change things as much as some people might like to think. Simply because there are no shining lights. Everybody’s bad. Lisa Linfield: 11:10 Yeah. Did the women inside those organizations not take up the fight? Lisa Unwin: 11:14 I think some of them are. The problem you have is that you could go in and say, “Why do we have a gender pay gap?” They will say, “Well because the most senior roles is the ones that pay the most. We happen to have many more men in senior positions than we do women.” Now, you can’t leave it at that. You then have to say, “Why is that?” And keep asking, “Why? Why? Why?” And start to understand structurally why too few women are getting through before you start to change things. I think it helps when individuals women can compare their own salary, but that’s only the tip of the iceberg really. It’s one of the structural issues that mainly women don’t get those middle management and senior management positions where the high salaries are paid. Lisa Linfield: 11:53 Obviously from your perspective, one of the major contributors is that there is either a real or a perceived barrier for women going back. I read that in some of the work you’ve done that 84% of women want to go back, but 75% say work is too inflexible. How much of that is perceived? How much of that is real? Lisa Unwin: 12:18 It’d be difficult to pinpoint exactly how much is real and perceived, but I think there’s probably more perceived in it than real. We know, for example, some other research has shown only 10% of jobs earning more than 24,000 pounds a year, this is here in the UK, are advertised with any flexibility. There has been a tendency for organizations to just simply advertise jobs as being full-time because that’s the default. If you get through to second interview process, and you ask about flexibility, often there is more often than you think if you just read the job within advert. Slowly but surely I think organizations are waking up to the need to offer more flexibility. That’s good, but change is quite slow. a bigger barrier for women getting back though, is they think that flexibility is a barrier. When they look at jobs that are advertised, they’re only advertised as full-time. They can see that’s a barrier. What they don’t realize is how much the recruitment market and the recruitment processes are the real barrier. Lisa Linfield: 13:17 When it comes to recruiters, I read from your work, only 9% of returning women got their job from a recruiter. Why is that? How did the rest find their jobs? Lisa Unwin: 13:29 I didn’t appreciate how the recruitment process works until I began to write this book. I’ve worked with a couple of them, and they’re very expert in the recruitment process and recruitment market. What happens if you say see a job advertised online, and you get your CV ready, and you reply. The first thing that happens is your CV goes into an applicant tracking system, which is a computer system which is designed to weed out the CVs that most look like the job profile that’s been advertised. If you don’t use the right keywords on your CV, the applicant tracking system is going to throw it out. If you put tables in your CV, some applicant tracking systems can’t read them. That CV gets checked out. Often if you have a career gap, if you’re not doing the exact same job that they’re looking for currently or have got experience in the last six to nine months, your CV gets thrown out. The first challenge is to actually write a CV that’s going to get through that computer system. Even if you manage that, the second challenge you’ve got is you’re going to be seen by a human pair of eyes, which researchers suggest spend six seconds looking at CV. In six seconds, and this is probably a fairly junior person working for a recruiter, they’re going to scan the top line. If you haven’t got a headline at the top that basically says, “I am doing this job now at your competitor now,” you’re not going to look very attractive. If you actually say, “I’m looking for flexibility and I’ve had a five year career break, and I’m 45,” your chance of being a good candidate for that recruiter to put forward are diminished. That’s why women who’ve got [inaudible 00:15:02] CVs need somebody who understands what they’re bringing. Women need to be smart as well because I’ve seen CVs where the first page talks about all the volunteer work they’ve been doing at the parent teacher association, and it’s all volunteering, and how many children they’ve got, and it’s a bit of part-time work they’ve done. It doesn’t look very powerful. Then, you turn over to page two, and you find out they’ve got a master’s in physics, and they’ve worked at some tech company and been very successful. Because that was five years ago, it doesn’t make it onto the front page. Women have got to be smarter. They’ve got to find people who are willing to take the time to understand what it is they bring. Lisa Linfield: 15:39 If only 9% of people found their job through a recruiter, how did the other 91% find their job? Lisa Unwin: 15:47 The vast majority, they found their jobs through their network, through people they knew, and through word of mouth. Now, we just stay with that for a moment. Women hate the term networking. When you talk about networking, they think about it as going to a stuffy hotel rooms, meeting people they don’t want to talk to, but that isn’t what we’re talking about here. We’re talking about all the people you know who could potentially make an introduction to someone who’s hiring people like you. That includes people you know from the school gates. It includes all the people you used to work with. Clients that you’ve worked with in the past. Friends. What we encourage women to do is really energize their network, and do that by having a clear, an elevator pitch, if you like, that says, “This is me. This is who I am. Here’s what I’m looking for.” Your network can only help you if you tell them what you’re looking for. That, essentially, is a lot of how people have found jobs. It’s easier than ever with tools like LinkedIn. It’s easier than ever to find all those people you used to work with, to work out who’s moved where, to reconnect with people, to find someone who could make an introduction for you. That is how people are getting, not necessarily their final job, but certainly the introduction to someone who can then introduce them and get an interview, and ultimately get a job. Lisa Linfield: 16:57 One of the major things that I’ve definitely experienced, and seen, and heard is this whole issue of confidence. For many people, they might have gone out the workforce before social media was such a major thing, and they, for example, were in marketing, but now have no clue how to do social media marketing. This issue of confidence, how do you suggest people tackle it? Lisa Unwin: 17:25 I think you need to break down what are the voices going on in your head, and get them out there, and just surface them, and really challenge them. Let’s take that digital marketing piece. Yes, marketing has moved on tremendously, as has technology, but you know what’s so much easier to learn things now. There are both paid and unpaid courses that you can go on to learn how to use things like Twitter, LinkedIn. How to use Hootsuite to schedule your tweets and social media. I had to learn this. Actually, I was going on holiday in October of the first year of She’s Back operation. I realized it was going to look like the organization died because I was going to be away for a couple of weeks. I thought, “There must be a way around this.” I sat down with my laptop, and Mac, an iPad and an iPhone. One of them I had a YouTube video showing how to use Hootsuite, and I was practicing it on the others. You know, within about two hours, I figured out how to use it. If it’s technology having moved on, you can learn that. I think the second thing you can do, if confidence is an issue, spend some time and go back and think about your career trajectory so far, and all of the skills and experience that you have, all of the contacts and social networks that you have, the people you know as well as the technical knowledge you have. Actually spending time articulating that can help you come up and go, “Actually, you know what. I’m pretty good. I’ve got a lot of experience.” I did some one-to-one coaching with another South African actually. She did that, and between one session and the next, when she wrote down all of the things she knew, all of the things she could do, all of the people she knew, when she came back and she had pages of stuff that was about her and her prior experience. You could just visibility see her feel more confidence as a result of just articulating that. Lisa Linfield: 19:05 If you were to be one of these woman, what would be your five top tips for people who are considering going back to work? Lisa Unwin: 19:13 I think the first thing is what we were just talking about. You’ve got to deal with the demons in your head that are telling you, “It’s not right. It won’t work. You can’t do it.” Writing this book, we met a teacher who told us she should have gone back three years before she did, but she just kept telling herself her family would fall apart if she went back. Actually, that wasn’t true at all. The first thing is just deal with the demons in your head. The second thing, then, is you’ve got to have your brand called you. People will help you if you can articulate who you are and what you’re looking for. That’s quite difficult. That takes time, and it’s about building your elevator pitch, and being able to say, “I’m Lisa Unwin. I’m an expert in branding and communications. I’m looking for work in the social service sector,” or whatever it is. Just something that helps people figure out who they could introduce you to. That’s the second thing about having an elevator pitch, building your brand, knowing who you are, and what value you add. The third thing, then, is about mobilizing your network, thinking about all the people you know, who could connect you to others. There will be people in your network you probably don’t realize who they are and what they know. I found out when I was [inaudible 00:20:17] a few years back that my son’s best friend’s mom was chief technology officer at the Financial Times. I had no idea. I just knew that was Ollie’s mom. There will be people there that can help you. You don’t know. The fourth thing is you have to make friends with LinkedIn. A lot of the women we spoke to in our initial research were highly active on social media when it came to Twitter, Instagram, and Facebook, but they [inaudible 00:20:42] LinkedIn because they thought of it as clunky, not right for them. They were actually a bit scared to go on because when you have a career break, you don’t know what’s put on there. That’s where you can connect with all of the people that you used to work with. That’s where the jobs are. You have to make friends with LinkedIn. Lisa Linfield: 21:34 I think that’s a hugely important point because for me, one of my big passions in life, as you mentioned, is that I see a lot of these women give up work for many reasons. It may be that childcare is too expensive. It may be that they want to spend more time with their kids. It may be for many, many reasons, and not least of which often is that was the example that was [inaudible 00:21:56] for them. When you look at people’s finances, and you work out that actually, in this day in age with the expenses that there are, it’s very difficult to be able to afford to retire when there is only one salary that’s contributing to the retirement part. Lisa Unwin: 23:11 I think one of the messages I want to get across is the younger women. They’ll say, “I’ve looked at the cost of childcare and it isn’t worth me going back.” I’m like, “Hand on a minute. What time frame were you doing that for? If you’re just thinking about next year, that might be the case. If there are two parents involved, why would you split this complication on one salary? But leaving that aside, if you take five years out, you’ll find that your market value by the time you go back and your childcare costs are low because your children are at school, your market value has dipped very significantly.” That’s a flawed equation. Another thing is I want to take them to one side and teach them about compound interest. Lisa Unwin: 23:49 You have people saying, “Well, I could go back but I’d only earn 24,000 pounds a year. So it’s not worth it.” Well, 24,000 pounds a year over 20 years is actually worth quite a lot of money when you do the maths. Lisa Linfield: 24:01 Absolutely, and you know, the challenge about this whole thing is that people actually don’t know how much they need to retire. If they knew how much they needed to retire, they’d work out that it’s a hugely important thing that they can retire. In my personal experience, I worked for five years flexible work hours between my first and my twins. I then was able to peg my salary to make sure that when I worked five-eighths, I got five-eighths of the money. By the time I went back full-time at the end of five years, then I was able to just multiply up the five-eighths to eight-eighths and get the full amount. Although for that period of time, my work wasn’t necessarily as stimulating as it could have been, I was able to stay in the workforce, maintain my confidence, and still be able to get back into it at a proper salary going forward, without having lost my connections or any of that. As you say, the challenge with this whole period of having kids and trying to get back into it is actually a very short period of time. Lisa Unwin: 25:11 We talk a lot about playing the long game and having an idea of the future. Being aware that you might have to make some sacrifices like you just suggested. You might decide that you’re going to go part-time, which means you can’t take on some assignments. You might not get promoted as fast as you want, but actually that slightly sacrifice you’re prepared to make, but at the same time, you need to get some things in place so you’re positioned to win in the long term which might be around investing in your networks. It might be around making sure, as you said, that at least your salary is pegged so that when you ramp up again, your salary’s going to move in the right direction. It’s really about not being too short term about these decisions. Lisa Linfield: 25:49 Absolutely. Also, what I think people don’t put into the equation in terms of, for example, childcare is so expensive, etceteria, is the fact that there are many benefits such as health insurance and health costs that a company does actually pay that you then have to try and afford. Lisa Linfield: 26:07 I think also one of things that a lot of us don’t factor in is this whole new ability to run a business online, and do things online, which might not be a huge income, but at least a place to start, and to grow some money, and some experience in some of the stuff. Lisa Unwin: 26:25 Starting a business actually gives, it’s something that’s given me … I’ve learned things that I would not have learned had I been in unemployment. I’ve had to figure out myself how to use Hootsuite, when to use Twitter, how to use LinkedIn. I’ve had to register for VAT, and all sorts of things that I wouldn’t have done if I had been employed. Lisa Unwin: 27:47 That helps out with the confidence piece doesn’t it? Because you feel good about learning something new. Lisa Linfield: 27:52 Absolutely. There’s a lot of research that says that of all the reward mechanisms for employees, one of the biggest reward mechanism is to feel like they’ve learned and achieved something new every single day. You can be highly motivated while setting up your business and learning more. 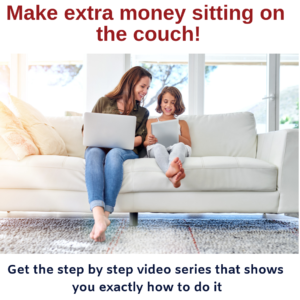 I also think it might not match a corporate salary, but if you get an online business going whilst you’re at home, you still have the ability to keep it going because you’ve done the hard work to set it up whilst you go back to work. It’s an and in my life, not an or. Lisa Unwin: 28:24 Right. Yeah. Lisa Linfield: 28:25 You have a thing called the manifesto for women. Your book starts with a manifesto for women. What’s that all about? Lisa Unwin: 28:32 We wanted to say some things at the beginning of the book that underpin our beliefs about the backdrop, if you like, for the messages that we’re giving out. One of them is that lives are complex and messy. Don’t assume that you’re going to start a career and get on a ladder at 22, and it’s all going to smoothly. That’s not going to happen for many of us for all sorts of reasons. You could ill, you could be relocated, your partner could move countries. Life’s up and down, and just accept that and be prepared to be nibble. Run with it and be able to deal with what life throws at you, which means being agile and having some of these tools at your disposal. Another thing is that we did believe that work adds something to our lives. Work is not simply, we talked about the financials, and it is about … We work for financial reward, but I think we do believe also that work adds something to our lives. The intellectual stimulation, the people you meet, the learning, the growing. Women, we have a right to that, but at the same time, it’s not all about that. The flip side is that your value is not solely developed at work. Don’t let yourself be solely defined by work. Don’t let work define you. Everything we do outside of work does enhance our value and make us more valuable. When we talk about giving advice to people after a career break, we’d say, “If it’s because you’ve been looking after children, parenting develops some leadership skills that you don’t develop when you’re sitting on top of a team, and you’re there because somebody’s given you a title.” If you think about bring up children and deciding what manners they’re going to have, what the family is going to eat. That is leadership right there. The manifesto is about some principles that underpin a lot of the advice that we give later on in the book. Lisa Linfield: 30:08 I think that’s fantastic. I think all of us do think that you jump into the workforce at 22, and it’s this direct trajectory up to the top as a straight line. It never is. It never is for anybody, male or female. There’s some times in your career where it screams ahead, and you have amazing opportunities. You’re ruling the world. Then, just as quickly, a change of leadership happens, and you’re smack to the bottom of that curve. It never is like that. I think that if more of us can really acknowledge that we have these zigzag careers, it doesn’t mean we’re not going to get to our end destination. It just means it might not follow a straight and upward chain. Lisa Unwin: 30:48 Look at what happened to me. I thought I could reach the pinnacle of my career. I was powering on and it was all I ever wanted. Then Enron happened and the firm collapsed. Lisa Linfield: 30:55 Yeah. Absolutely nothing to do with you at all. Lisa Unwin: 30:58 With the way that technology is moving, with it being such an age of destruction, no one can think that their career is safe for the next 30 years. Who knows how technology will change things? This is going to happen irrelevant for women and men increasingly, I think. Lisa Linfield: 31:14 Absolutely. You’ve written this book, She’s Back. 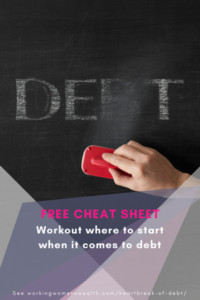 It’s a very practical tool about helping people to not only just with understanding getting back to work, but also about practical steps and practical things you can take. You’ve published it, and now, you’ve had some time to have the responses from people. Has the theory of all the research you did mate with the practically reality of women out there? Lisa Unwin: 31:42 It has, and more. Originally, we wrote this for women who had taken a break and wanted to get back. Actually, we recognized that a lot of the messages in here are relevant for women at the beginning of their career, and men. Women and men at the beginning of their career, in mid-career, and we’ve been increasingly asked to go into organizations to talk to women in the workplace, who’ve not had a break about how to navigate sustainable careers in an age of destruction. Particularly, mid-career level people. Particularly women where they find that they have a lot of attrition, and they think we’ve got some messages that will help people keep their careers on track. It’s proving that the messages and tools are relevant just as much for people in work as they are for the people trying to get back into work. Lisa Linfield: 32:28 Absolutely. At the end of the day, one of the biggest things in terms of the success of people returning to work is to have bosses that deeply buy-in to the process. Lisa Linfield: 32:41 I’m sure there are a lot of people out there that would love to read your book and learn more about what it is that you are doing. How would they be able to get a hold of you and your book? Lisa Unwin: 32:51 Our book is available on Amazon, and some book shops as well, but I think Amazon is the most reliable mechanism at the moment. We have a website called, we’re not very innovative, our website is www.shesback.co.uk. We also have quite an active Facebook group, which is also called She’s Back. It’s a quite interesting group of people. There are women who are looking to return. There are women in work, and men. Where we just debate and share issues, advice, tactics. People will pose a question. It’s quite a good, lively group. If people want to get engaged in a conversation, that’s the place to go. We also have a new venture at the moment. It’s called the Reignite Academy, which is specifically working with six more firms who have said, “Look. We need to do something about this problem for women. We know we’ve lost so many women at the associate level, let’s put on a program to help some of them get back.” That’s just launched, so if anyone knows any lawyers in London who are looking to reignite their careers, that’s interesting. That’s what we’re doing at www.reigniteacademy.co.uk. They’re the main places that you’ll find us. Lisa Linfield: 33:56 That’s fantastic. Thank you so much, Lisa, for joining us today and for sharing your knowledge and insight on returning back to work. It really is a huge passion of mine, and I think very relevant and real challenge, as you say. There’s so much that acknowledges the problem of the fact that there are so few people in senior leadership, and women leaving the professions they’re in, but there’s not much practical support as to how do you actually do it, and what steps do you actually take. It’s fantastic to know that there’s this fantastic resource out there that can help our listeners to share with other people about how to encourage them to get back into the workforce. All of our economies globally can’t afford to have such well-skilled people that would love to get back. 85% of them wanting to get back, but believing or perceiving that the world out there is an inflexible place to be in. Thank you for joining us. Lisa Unwin: 34:56 Thank you very much. Lisa Linfield: 34:57 For those of you out there, I’m Lisa Linfield, and this is Working Women’s Wealth. Please do go and research shesback.co.uk, or buy Lisa’s book on Amazon. Take care and have a great week.